The falling unemployment rate (6.3% in April) hasn’t done much to dent Americans’ pessimism about the economy. In a Pew Research Center survey released Monday, 65% of people say jobs in their community are difficult to find — down from the record levels seen in early 2010, but far above pre-Great Recession levels. Only 27% say jobs are plentiful. But the jobs and unemployment numbers are net figures, and obscure much of the U.S. economy’s churn and change — which is the way people looking for work or considering switching jobs or careers actually experience it. Other, lower-profile measures do capture those dynamics; they show that something has changed in the U.S. labor market, and not for the better. The monthly Job Openings and Labor Turnover Survey, or JOLTS, provides estimates of vacancies, hires, voluntary quits and involuntary separations starting in December 2000. (The latest JOLTS numbers are from February; March numbers are due to be released this coming Friday.) 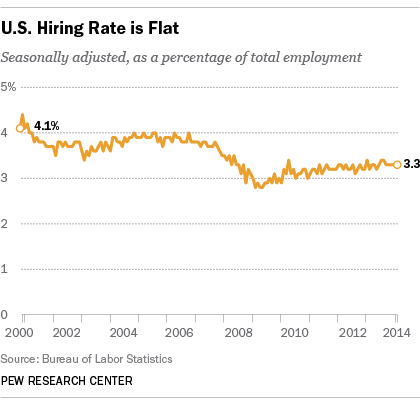 The most immediately striking thing about the JOLTS numbers is how flat hiring has been for some time. February’s seasonally adjusted hiring rate — defined as hires as a percentage of total nonfarm employment — was 3.3%, the same as it’s been since October last year. In fact, there’s been no significant improvement in the hiring rate for nearly three years. 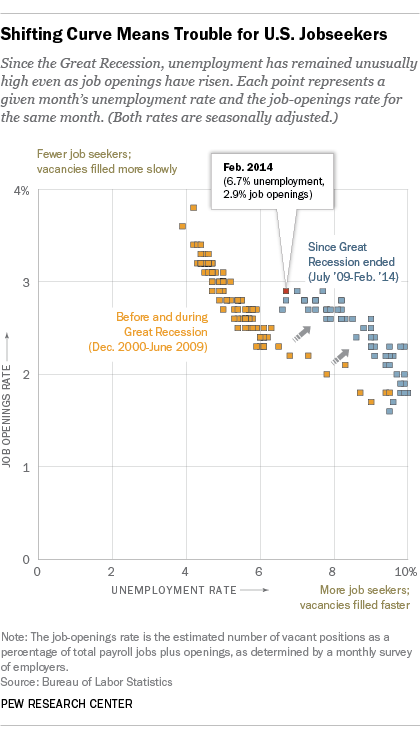 By comparison, the hiring rate before the Great Recession typically was at or near 4%. The quits rate — the number people who voluntarily leave their jobs as a percentage of total employment — has improved somewhat from its 2009-10 lows, but at 1.7% is still well below pre-recession levels (typically 2% or higher). The quits rate is a good indicator of labor-market confidence, since people are more willing to leave their jobs when they’re confident they can find a better one. Job openings have, in fact, rebounded strongly from the recession, though not quite to their pre-crash levels. But even that silver lining comes with its own cloud: Unemployment is higher than one would expect, given the historical relationship between openings and unemployment. The job-openings rate — the estimated number of vacant positions as a percentage of total payroll employment plus openings, as gathered in a monthly survey of employers — typically moves in the opposite direction from the unemployment rate. This makes intuitive sense: When unemployment is low, there’s a smaller pool of readily available workers, so openings can take longer to fill; high unemployment means lots of available workers, presumably making it easier to fill any vacancies that occur. Plotting the two rates together creates what economists call the Beveridge curve. This shift is reflected in the continuing high levels of long-term unemployment. In April nearly 3.5 million people, or 35.1% of all unemployed, had been out of work for more than 26 weeks. Economists have offered several explanations for the persistent long-term unemployment: an unintended consequence of extending jobless benefits; a mismatch between the skills unemployed workers have and what employers want; a breakdown in the efficiency of labor markets; or more workers living too far from the available jobs.